Don Colburn is an award winning journalist and poet from Portland, Oregon. His newest book, TOMORROW TOO: The Brenda Monologues, is a deeply moving collection which rose from a news story he covered while reporting for The Oregonian. The narrative is deceptively simple. 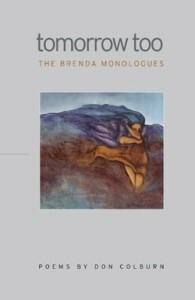 Brenda, a talented actress, became pregnant in the interval between her breast cancer’s onset and its discovery. A year-long struggle to save herself and her developing daughter followed. After Brenda’s death, Colburn remained emotionally entwined in the story and searched for its fuller expression of its triumph and tragedy. He found it in this magnificent book. He takes the reader beyond spare journalism deep into the human lives swept up by such currents. Seven identified voices, including Brenda, daughter, family members, Doctors and Cancer itself, speak their experiences in 14-liners −twenty-four unrhymed sonnets. They flow, through the silences following each, into a coherent statement of truths we all share in the isolation of our lives. Lines between journalism, theater, poetry and story dissolve. A spoken opera of life evolves aria by aria and is delivered with great elegance. Clear and subtle, harmonies and discords sing on the pages. One poem, written in dialect, did grate at first. But reading the pieces aloud placed that sonnet firmly and beautifully into the arc of the book. Full appreciation for TOMORROW TOO’s art may require it be read aloud at least once. Beyond the depth and range of emotions Colburn delivers, there are also highly skilled elements of poetic craft. Two, of many, deserve comment of their own. The first centers on the power of form. The lyric balance between the voices eases their transformation into a coherent whole. His chosen form’s 14-line constraints drive an equal weighting of voices. Each statement stands alone as a well written poem. None stand out as more, or less, important to the theme. They can be played against the others individually, or in groups, as we trace Colburn’s semantic map to find our destinations. The second, seemingly contradictory, lesson is that there are no borders in art. Elements of journalism, poetry, and theater run through this book and all are necessary. Colburn’s breadth of understanding these arts is a key to his success. His carefully crafted use of each enhances them all. This book stands as a single beautiful poem which might come to be seen as one of our century’s great works. It expanded the room in my heart for joy and may likewise enrich yours. Tim Pfau is a Salem poet who’s read, written and occasionally published poetry since his childhood. He has served on the OPA Board and as Membership Chair. He says that he is most moved by the human stories shared in poetry.